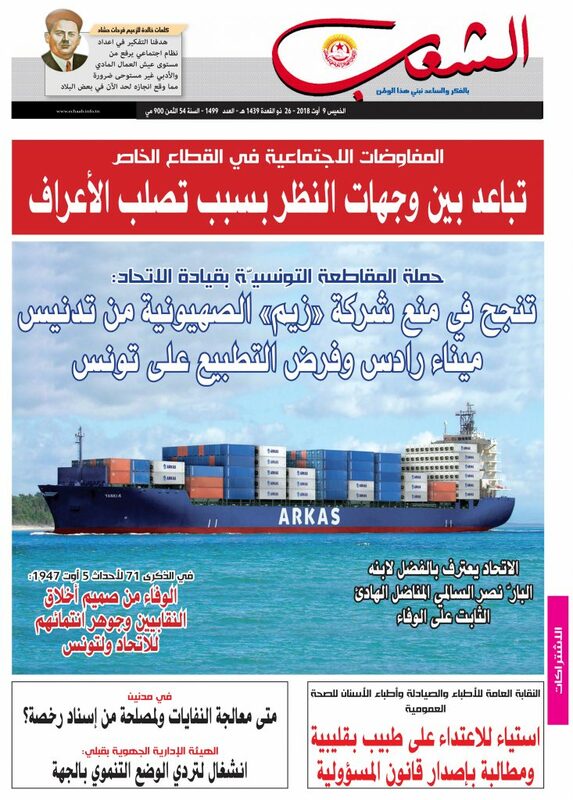 Newpaper of Tunisia’s UGTT labor federation celebrates workers’ victory in turning away Israel-linked cargo ship. “The dockers union affiliated to UGTT presented yesterday a file on Cornelius A to the chief of the port of Radès, and they threatened to block the port if the boat would be allowed to dock,” TACBI, the Tunisian Campaign for the Academic and Cultural Boycott of Israel, stated on Thursday. On Monday, UGTT, Tunisia’s main labor federation, had called on its member unions and port workers to refuse to handle the ship if it landed at Ràdes. This followed a call by Palestinian trade union federations on their Tunisian counterparts to mobilize all efforts to stop the Cornelius A being unloaded in Radès and to prevent normalization of ties with Israel more generally. UGTT celebrated the victory with a banner headline in its newspaper. On Thursday, 9 August, the Vessel Finder website showed the Cornelius A heading away from Tunisia. Activists in Tunisia believe the Cornelius A is part of a covert network of Israeli trade that violates their country’s boycott of Israel. While the Cornelius A is Turkish-flagged and owned by the Turkish company Arkas, it was operating on behalf of Zim. Activists believe that the Cornelius A is not the only Zim-chartered ship to frequent Tunisian ports. The UGTT and TACBI are demanding action to stop the covert trade. The victory for Palestinian rights campaigners in Tunisia is reminiscent of how US activists and labor organizers spurred by Israel’s military attack on Gaza successfully prevented Zim ships from unloading at the port of Oakland in 2014. The industrial action by dockworkers in Radès shows that any government attempt to normalize relations with Israel is diametrically opposed to the will of the Tunisian people.